BASKET STAR VIDEOS!! Gorgonocephalus and relatives in motion! Yow! GORGONOCEPHALUS!! Because Weird is what we do! 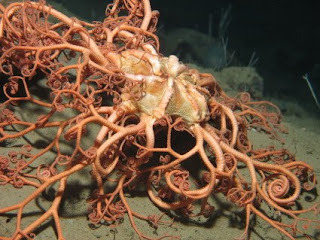 Its been awhile since I've done a "creature feature"..so today, I give you the "Basket Star"aka Gorgonocephalus!! Go here for a photoessay. 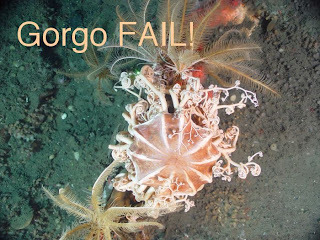 Gorgonocephalus belongs to the class OPHIUROIDEA, that is, it belongs to the same group as the more typical 5-armed "brittle stars" you may be more familiar with. Such as the one here and the ones here. 1. 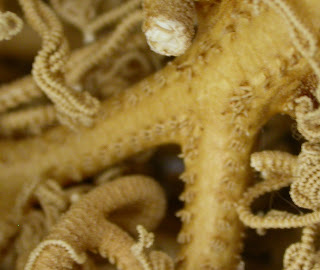 Arm structure in basket stars has a thick, fleshy covering over the basket star endoskeleton. If we look at a cross-section through the arms, we see in green that there is an exterior leathery "skin" that completely covers the calcium carbonate "ossicles" aka vertebrae that compose the arm structure. 2. Arm structure (i.e., the vertebrae-like endoskeleton) in this group SPLITS (aka bifurcates) instead of staying in a single linear series. 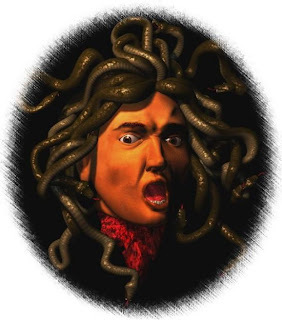 There's a whole bunch cool stuff about Gorgonocephalus, the least of which is its NAME, which literally translates into "Gorgos" and "-cephalus" aka the Greek for "Gorgon's Head" named for the fearsome monsters (e.g., Medusa) with snakes for hair whose gaze could turn people to stone!! ....and here is one for comparison! Remarkably little is known about these animals. But there are some GREAT feeding studies on Gorgonocephalus, including this recent one by Rosenberg et al., (2005) and this earlier one by Emson et al. (1991). So, let's look at that! 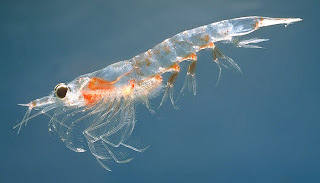 Gorgonocephalus feed mostly on small crustaceans and similar critters, such as the "northern krill" Meganyctiphanes norvegica . 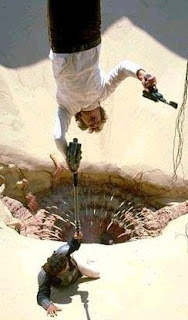 That's in contrast to other kinds of "filter feeders", like crinoids, that pick up small to microscopic food particles. 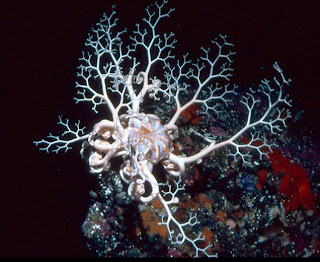 Functionally, this makes basket stars-PREDATORS! 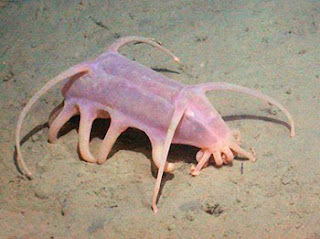 Pretty weird ones, when you think about it..
Bear in mind that the arms are covered with HOOKS and SPINES! The studies I read suggest that Gorgonocephalus prefers a pretty mellow current. Rosenburg et al. (2005) mention that in high current speeds (> 50 cm/second) these animals have difficulties keeping their arms stretched out and the number of curled arms increased, which they believe will decrease drag!!! So a happy one might look like this! NEWSFLASH! Echinoderms are Important to The Carbon Cycle!! 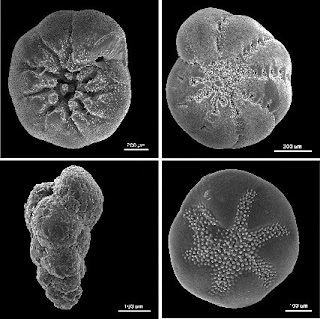 So, in a forthcoming 2010 issue of Ecological Monographs, a forthcoming paper by Mario Lebrato and authors from the University of Southampton (click here to see citation), shows the impact of echinoderms on the global carbon budget!! What the frakkin fruk is a global carbon budget?? What does it matter?? Why should I care?? How are echinoderms involved, anyway??? Carbon is an important element to living organisms and all organic things on the planet. It cycles through living and unliving things, but it is used and reused in all organic systems. If the "Force" from Star Wars was real, it would be carbon. It binds, us and ties all living things together. Where it gets built up or "sequestered" can be an important consideration for understanding these global cycles. 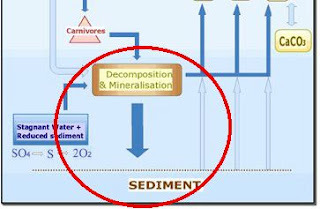 But let's take a CLOSE-UP look at a specific part of the Marine Carbon Cycle....about "Decomposition & Mineralisation". Echinoderms (& Other organisms) Enter the Fray! Echinoderms are essentially MADE out of a mineral called calcium carbonate (CaCO3), also known as limestone, chalk and several other names. The crucial part of this mineral is the carbonate, which is made out of carbon and oxygen. Thus, echinoderm bodies act as kind of a "bank" for carbon on the deep-sea bottom! 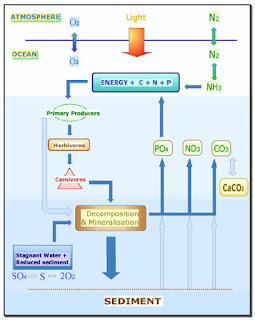 It sequesters or stores carbon as part of the process of recycling it back into the water column and beyond! 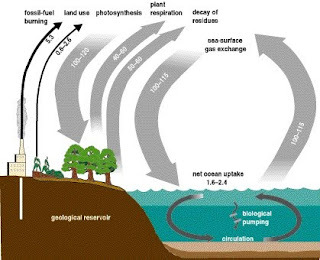 But up til' now, the contribution of carbon to this system was poorly understood. When echinoderms die (i.e. decompose), their bodies fall apart (i.e., disarticulate) and those carbonate pieces fall into and are buried into the sea bottom and begin the "carbon cycling" process. Lebrato et al. found that on a global scale, echinoderms have a PRODUCTION rate of approximately .861 Pg of CaCO3 (Pg=petagrams=1 billion metric tons!) per year!! So echinoderms produce just short of of 1 billion metric tons of calcium carbonate a year!! The amount of echinoderm carbonate, which is right now, present on ocean bottoms aka the "Standing stock" is about 2.11 Pg of CaCO3 from organisms on the continental shelves, slopes and abyssal depths (1000+ m). Apparently, more then 80% of global calcium carbonate production from echinoderms comes from animals that occur between 0 and 800 meters!! With the highest amounts attributed to the shelf and upper slope. and sea urchins... LeBrato et al. calculated "standing stocks" (i.e., the amount present today) from all around the world with different species making up the overall CaCO3 standing stocks in different parts of the world. Much variation exists. 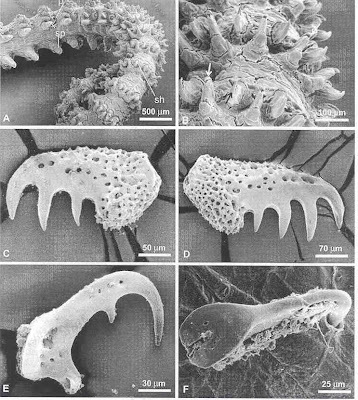 Apparently, more then 80% of the substantial CaCO3 stocks were found in shallower then 800 m depths, especially from 0 to 500 m.
To refine the number above, echinoderms "sequester" or "capture" about 0.1 gigatons of carbon per year. This is apparently MORE then is "captured" by benthic foraminifera but less when compared against what is "captured" by pelagic (those that live in the open ocean) organisms, which capture about 0.4 to 1.8 gigatons. By comparison, human activities produce about 5.5 gigatons of carbon every year. Perhaps most critical is that the authors have found that there are regions around the world where the minerals used to form calcium carbonate are undersaturated (i.e., not as rich in the minerals needed to from calcium carbonate). The authors attribute this directly to ocean acidification with the gravest concern of what should happen when this reaches the richest "standing stock" areas (i.e., where the bulk of echinoderms occur). So, we are now JUST learning about the importance of carbon (in the form of calcium carbonate) that is "built up" on the sea bottoms (i.e., the benthos). What happens if this cycle is interrupted? 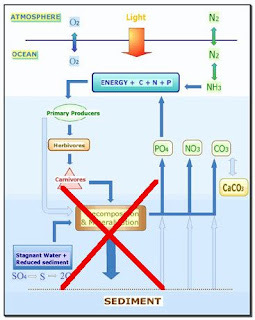 Will the loss of carbon (in the form of calcium carbonate) sequestered on the sea bottoms result in ecological changes or worse?? More Exotic Hawaiian Starfish! Valvaster and Astropecten! Today, MORE Exotic Hawaiian starfishes sent to me to ID!! Thanks to Gordon Hendler (Los Angeles County Museum) who found the specimens and Cory Pittman, who photographed the specimens! 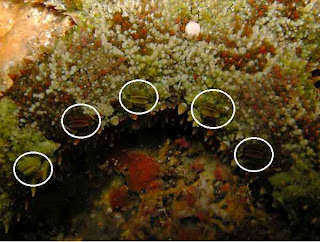 Let me caveat that Astropecten (family Astropectinidae) is VERY hard to identify from pictures! In a professional sense, having vouchers is the best way to ID them..
First, Astropecten polyacanthus Like all Astropecten (there are 2 in shallow-water Hawaii), this species burrows into the sea bed and live under a fine veneer of unconsolidated sediment, where they feed on various small, molluscan fare..snails, clams, etc. This beast is about 2 inches in diameter and was collected in Maui from about 9.0 m. It is distinguished from the 2nd species by having spines in each interradius and adults should only have one spine per superomarginal plate (but this is difficult from pictures) A second specimen (also discovered by Hendler/ photographed by Pittman) from Maui at about 10 m is possibly a Astropecten triseriatus myobrachius. This specimen was only about an inch in diameter. This species differs slightly, in having 2-3 spines per plate and is missing the spines pointing aborally (i.e., upward) in each interradius.. Although, this seems like A. t. myobrachius to me, its entirely possible that this is some kind of juvenile of the species above with smaller features. THESE are the kinds of FACTORS that make taxonomic identification difficult (and challenging)! This animal was from Guam and is a borrowed image from Gustav Paulay's excellent FMNH site on Indo Pacific animals. Note that this one in Wikipedia? NOT Valvaster (looks like an oreasterid or a goniasterid). Pls. make a note of it! ...from Hawaii: Something you don't see every day Coscinasterias acutispina! 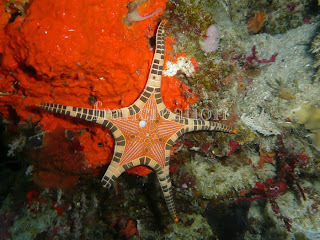 Today a cool pic of an uncommonly seen starfish from Hawaii! Coscinasterias acutispina! The animal was found by Pauline Fiene and was photographed by nature photographer Cory Pittman (and should be copyright by him). Both Pauline and Cory oversee the cool Sea Slugs of Hawaii site. Coscinasterias acutispina is an asteriid-that is, its related to those common intertidal starfish, such as Asterias or Pisaster that feed on mussels and clams on the east and west coasts of North America. The beast above was observed in Kahului Harbor in Maui. It's about 30 mm in diameter and was found at less than 3 m depth, under rubble. These have been reported from Hawaii in the past, but have been so infrequently encountered that they are actually absent from the excellent Hawaiian Sea Creatures book by John Hoover. Generally, starfishes in the family Asteriidae occur in cold-water regions like Antarctica or Alaska, but every so often-you get a couple that pop up in temperate to tropical shallow waters. For various reasons, asteriids and other forcipulatacean starfish don't generally live in tropical shallow-waters. So, seeing one outside of temperate water is unusual. Coscinasterias occurs rather widely though, and you can find other species from New Zealand to the tropical Atlantic...Here's some basic taxonomic info..
Coscinasterias acutispina is unusual in that it is fissiparous (i.e., it can reproduce asexually-by pulling itself apart), has between 7 to 12 arms and feeds on limpets and other small mollusks. Ya' wanna know more about unusual Hawaiian Starfish?? Go visit John Hoover's site here. And thanks to the wonder of Teh Internets! Here is a Youtube Video of this species (but from Japan..I think??) !! EDIT-Note that there are tiny, little snails on the underside that might be parasitizing the starfish (I don't think they are being fed upon). Thanks to Mudskipper for the call! Iconaster longimanus: got a starfish? 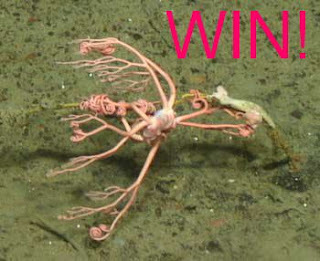 Share it on the Echinoblog!! Welcome to the first post of the new year! I thought I would kick-off the year with a new kind of post! Many of you know that as a taxonomist, I am happy (when i have the time) to identify images of various species that are sent to me from YOU the public. BUT up until recently, I performed this service privately. I am one of the few people in the world who can ID these beasts with some authority, so my time to do "freebies" is at a premium. So, I was thinking that pics of animals I identify CAN (and should?) BE SHARED with the PUBLIC! Today's beast is member of the Goniasteridae, called Iconaster longimanus. A beautiful animal that is found in the central Indo-Pacific, including the Philippines, Singapore, the South China Seas, Indonesia, SE Arabia, and in Northern and western Australia, including Queensland in 6-85 meter depths. You can find a paper I wrote about the taxonomy of Iconaster here. Today's picture was provided by marine photographer Franca Wermuth, whose website can be found here. My understanding is that she's normally a nudibranch afficionado, but has now added starfish to her list of interests! The animal above was photographed in the Philippines from Romblon (Romblon Province, Romblon Island), next to Lugbung Island in about 35 meters depth. Water temperature was 27.2°. Relatively little is known about Iconaster's biology. Its name Icon is from the Greek eikon for portrait or image, and possibly refers to the way the marginal plates form a frame around the edge. And -aster of course refers to the word "star". Its species name longimanus translates into "long hands" which clearly makes reference to the extended arms. What may seem common to divers around the the reefs of Pulau Hantu and the Southern Islands, is actually an animal that is listed as "Vulnerable and rare" by The World Conservation Union's Red Data Book. 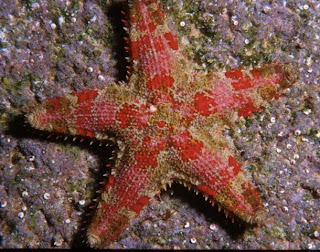 The icon star (Iconaster longimanus) is a striking species that occurs on lower reef slopes and the adjacent sea bed around many of the Southern Islands. It feeds on epilithic growth on hard substrata and coral rubble. Zoologically, it is interesting as it has large lecithotrophic eggs which show abbreviated development, without a larval stage. 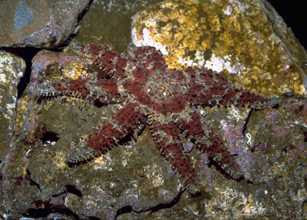 In recent years this sea-star has been found to be moderately common on and around many of the reefs fringing the Southern Islands. However it is considered vulnerable because living on and near the slopes of fringing reefs, it is threatened by reclaimation activities. Additionally, its attractive appearance many lead to over collection as a curio. Such threats are of particular concern given its slow growth rates. Go HERE to see even MORE pictures of Iconaster longimanus! The only thing I can add? Iconaster has been made into a plastic toy!